This post is written by Paolo Novak. Paolo is conducting research on asylum seekers’ reception in Italy, funded by the British Academy/Leverhume Small Grant SG162483. I love food, as all those who know me, or perhaps just see me, can confirm. I love the full spectrum sensorial satisfaction it provides, and the social life that defines each plate and accompanies its consumption. It is perhaps not surprising, then, that food has always been an important part of my research. My study of protection and assistance activities in support of Afghan refugees in Pakistan had food distributions in refugee camps as one of its central concerns. One question animated that line of research: who gets what and why? While all registered Afghans were entitled to a certain amount of food provisions, not all would equally receive rations, for a variety of reasons that could be linked to changing geopolitical agendas, tribal and patriarchal norms, NGO ‘best practices’, embezzlement, situated contingencies, etc. Through that study, I engaged with debates about place-making, empire and imperialism, as well as Derridian understandings of ‘social excess’ and their relation to the constitutive irresolution of law. Food equally haunted me during the bout of field research that I have completed this summer as part of my ongoing project entitled ‘Asylum seekers’ reception: taxonomies and location’. Emerging strongly as a key concern of the asylum seekers I was talking to in Italy, food soon became a crucial site of investigation that allowed me to capture the essence of the reception system set up by the Italian government. Food is an important site of regulation and enforcement in the Italian reception system as in all humanitarian situations. The Prefettura (decentralised office of the Italian Ministry of Interior) clearly details the diet that each asylum seeker should be provided. In the bando (public tender) that regulates the activities of NGO contractors, it is stated that for breakfast, “one hot drink, some crackers, butter, jam, or some biscuits”, should be served. For lunch and dinner, each asylum seeker should receive “a first serving of about 100 to 150gr depending on the type of sauce it is served with, of pasta, rice, or couscous. Alternatively, 80gr. of pasta and 100gr. of legumes, semolina or rice. Pizza is also allowed”. This should be followed by “a second serving of red meat (150gr), white meat (200gr, or 250gr if it has bones), 200gr of fish, two eggs, or 100gr of cheese; accompanied by a side of vegetables (300gr) and followed by fruit (150gr, or one fruit like banana apple, pear, orange, etc.) or alternatively yoghurt, or, twice a week a single portion dessert. Two pieces of bread (60gr each) and 1lt. of water” should accompany the meal, and “spices should be made available, even in single dose packages”. Forget Paleo and Dukan! The Mediterranean diet is still the best – at least according to the Italian government. This dietary advice is seldom followed, and I met many asylum seekers who wanted me, as a researcher, to take note of what they felt was very poor food. It certainly did not look enticing and I certainly did take note. Indeed, the significance of food for understanding the way in which migrants intercepted at sea by FRONTEX (European Border and Coast Guard Agency) Search and Rescue operations and warehoused in reception centres like those that I visited this summer, goes well beyond policy questions such as who has responsibility for food provisions, what is the best way to deliver the necessary caloric intake and provide a balanced diet to those in need, what lessons can be learned, and what can be done to improve the current provision system. As I suggest in The Conversation, food is a foundational kernel in the configuration of the reception system for asylum seekers in Italy. It is subject to contestations, refusals and reappropriations. 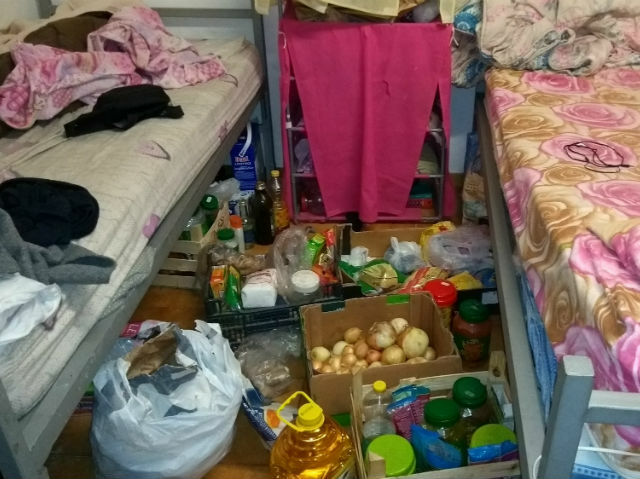 It is a source of income for the many hotels, restaurant and catering companies that are contracted to deliver that service, despite the Italian public’s perception that monies spent on asylum seekers’ reception go directly into the pockets of migrants. It has, perhaps more fundamentally, become a marker of a pure ‘national identity’ into which migrants should assimilate. During the summer, I often found myself buying food for people hosted in these centres. I bought fruit, as the vitamin intake from most people’s diet seemed appalling to me. I bought some meat for Eid-ul-Adha. I would often accompany migrants by car to local discount stores so that they could buy some food staples. Given the remote locations in which many of these centres are placed, the 10-25 minute car journey to these supermarkets would save them a bus fare of 1.60-5.50 € (depending on the location), a risky walk to the bus stop along roads not meant for pedestrians, and a long wait for the scant public transport available, let alone the racist abuse occasionally encountered along the way. For sure, policy interventions such as providing food cash allowances, allowing asylum seekers to cook for themselves, or to manage reception centres’ kitchens some days a week, could decisively ameliorate the conditions of their stay, and would restore a degree of agency to them. Indeed, a few NGOs proactively engage with asylum seekers’ demands in this respect. The more significant point, however, is that while asylum seekers are asked to integrate into Italian society by eating pasta, the socio-spatial distance that separates them from most Italians living nearby seems very difficult to reduce, other than through radical transformations. The foodie I am myself I can relate to your insights about food distribution practices specially in the context of eating habits. Linking it with philanthropy or charity work that goes in Pakistan specially during the month of Ramzan, I have wondered that people on the giving side opt for an easy solution based on the non-healthy dietary preferences of the people. I am amazed to learn about the Italian reception system for humanitarian work and would be taking out time to research on cost estimates for this kind of food support system to be introduced for orphanages and child protection bureaus working in Pakistan to gradually introduce.